Welcome, dear visitor, to our section on gazebos. Gazebos are a fantastic addition to your backyard, lending themselves both to the festive times where you might entertain guests, as well as the quiet times when you just want to relax in your backyard. 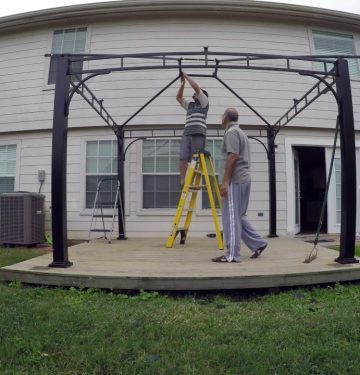 Long story made short, a gazebo creates a living room in your backyard. It encloses just enough space and provides just enough shelter from the elements so that you can freely lounge as you would in the living room, however, you also get to enjoy the wonderful outdoors. In terms of features, gazebos come in quite a variety of shapes and sizes. The two main types of gazebos you’ll see out there are hard top and soft top. 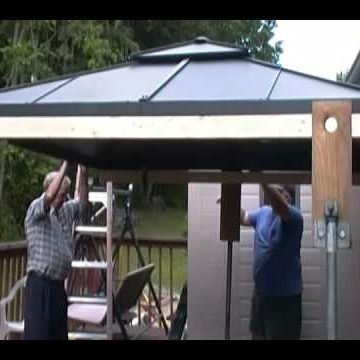 Exactly as the name implies, hard top gazebos feature a solid roof (as well as a sturdier build overall), while soft top gazebos typically have roofs made out of fabric (which is set up on a lighter, more portable frame). They inherently have their own advantages and possibilities, so there is a time and place for each. Beyond the roof style, gazebos also come in a number of sizes. Depending on your needs, you can get one that covers more or less space. When picking size, it’s important to consider first what can fit comfortably in your backyard. After that, you should take into account what you plan on using your gazebo for. More specifically, you should think about how many people you would like to fit in there and what kind of furniture you want to have under there. All these points will dictate the most appropriate size of gazebo you should be going for. Last but not least, gazebos do need a bit of love and care (and they certainly return the love they are given). When you first get your gazebo, it will require some assembly. The amount and ease of assembly varies with the size and model you get. For example, a hard top gazebo will understandably take a bit more time to set up than it’s lighter soft top counterpart. Another important aspect of caring for your gazebo involves winterizing. Where applicable, the winter months can be a bit hard on gazebos. Some lighter models can be packed up and taken inside for the winter, however, this might not always be possible with the larger ones. Fear not, however, as gazebos can certainly brave the winter and come out victorious in the spring. They just need to be adequately prepared for the season ahead of time. For the full details, you can check out our guide on how to winterize your gazebo.